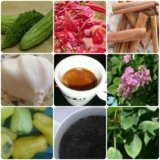 EXPERIENCE: I have been experimenting with herbals like cinammon tea, gymnema tea, and also bitter melon. They have been helping bring my sugar readings in the morning, fasting from around 200 to 150. I recently read about hisbiscus tea, and have been drinking it regularly and my readings have gone even lower to around 135. The bitter melon worked excellent but it was too bitter so decided to try to find another natural way to fight against diabetes and finally I found a pleasant solution with the gynmema, cinammon and hisbiscus tea. In spanish hisbiscus is called "Flor de Jamaica" and you can find it in the Mexican Markets, they sell it by bulk. Of course since I have this illness since I was 35, now I am 52 so there have been 17 years, and I am still on the pill only. I take "Janumet" which is a lot more expensive than regular glucophage but I think it is much better. I also have started walking to work which is 3 miles, round trip, 3 times/week. The other 2 days I am taking volleyball class. I am so happy with the results, a combination with exercise, diet, mostly protein and fruits and vegetables, and oral medicine. My readings has never been so close to normal! 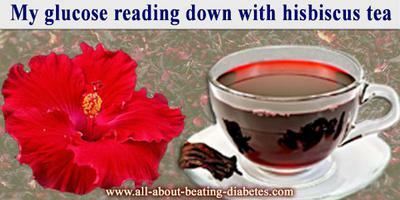 Thank you for sharing with us your wonderful experience of lowering your blood glucose with hisbiscus tea. In addition, I would add that several studies have determined that hisbiscus tea can have good effects on the blood lipid profile in diabetic patients. Therefore, a diabetic will be protected from high cholesterol problems and related cardio-vascular concerns.